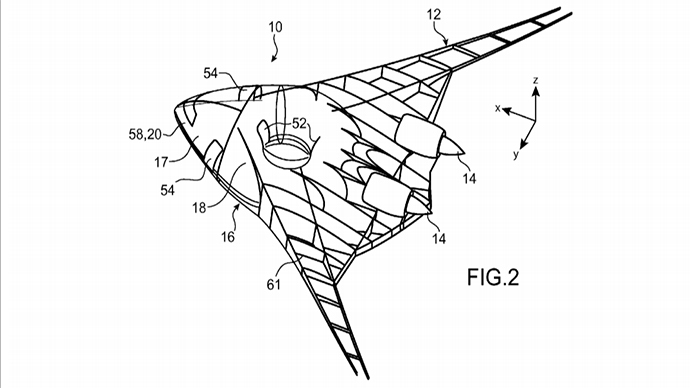 Airbus has filed a patent for a new concept plane that looks more like a Star Trek contraption than a conventional jet. The “bagel plane” will seat passengers in a ring, while its new body shape will allegedly minimize the aircraft's structural stress. While the traditional “approximately cylindrical” geometry of an aircraft's cabin is designed to withstand pressurization loads, the front and rear ends of the cabin are much more sensitive to such loads, the patent application states. It goes on to offer an easy solution – twist the cylinder into a bagel shape with no longitudinal ends. “The purpose of the invention is particularly to provide a simple, economic and efficient solution to these problems, or at least partially overcome the...disadvantages,” the application says. The interior will see passengers seated in a bagel-like formation rather than in neat rows, as per the traditional jets. This formation will maximize efficiency, while the aircraft’s shape will reduce stress on the front and back ends of the plane. Apparently, this will also allow for a higher volume of passengers. “An approximately cylindrical geometry limits possibilities for increasing the passenger carrying capacity of the aircraft,” the application states. However, Airbus spokesman Justin Dubon told NPR that the design is not currently in production. “There are some very clever people here that have fantastic ideas. And who knows? Maybe one day they will come light,” Dubon said. However, he reminded that more than 6,000 patents every year are filed by the company. Only “some of these become the seed for other ideas with practical use,” he said. Other bizarre ideas produced by the company have included the possibility of introducing bicycle-like “standing” seating for passengers in economy class, and the introduction of virtual reality helmets to entertain passengers. The “bagel” is, however, one of the biggest adaptations made to the whole structure of the aircraft. An analyst at the Virginia-based Lexington Institute, which receives funding from Airbus’ rival Boeing, told the Financial Times that there is some skepticism surrounding the idea. “I’ve never seen anyone suggest anything like this in a heavier-than-air system,” Loren Thompson told the paper.